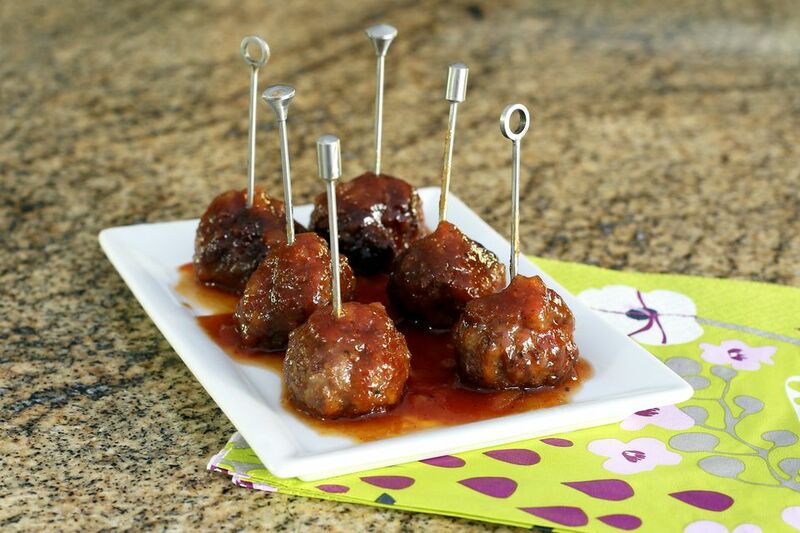 These party meatballs are flavored with a sweet and tangy homemade barbecue sauce. I add a small amount of ground cayenne pepper to the sauce, but feel free to leave it out. For the sausage, I used Jimmy Dean Country Mild, and it gave the meatballs excellent flavor. Use another type of sausage if you have a preference. Italian sausage or a fresh chorizo would be very good, or use another brand or variety of breakfast sausage. The meatballs can be used in just about any recipe calling for meatballs. If you have a stand mixer, use the paddle attachment to mix the meat ingredients. The recipe makes about 4 dozen meatballs, so it's perfect for a holiday or game day party. Line a large rimmed baking sheet (half sheet pan) with foil. Place a cooling rack in the pan. Or use two jelly roll pans and smaller cooling racks. The cooling rack helps keep the meatballs out of the fat, but if you don't have one, arrange the meatballs right on the foil. In a large mixing bowl combine the ground beef, sausage, bread crumbs, milk, beaten egg, 1 1/2 teaspoons of kosher salt, 1/2 teaspoon of garlic powder, the allspice, and 1/4 teaspoon of black pepper. Mix to blend the ingredients thoroughly. Place the meatballs on the rack(s). Bake the meatballs at 350 F for 25 to 30 minutes. Meanwhile, in a medium bowl, combine the ketchup, brown sugar, vinegar, Worcestershire sauce, minced onion, 1 teaspoon of garlic powder, 1 teaspoon of kosher salt, 1/4 teaspoon of black pepper, and the ground cayenne pepper. Stir to blend. Transfer the cooked meatballs to the crock pot. Add the sauce mixture. Serve from the slow cooker with toothpicks and napkins for guests. Use 1 clove of fresh pressed garlic in the meatballs and 2 cloves of fresh pressed garlic in the sauce. Replace the ketchup with a mild barbecue sauce. Reduce the brown sugar to 1/2 cup or use an equivalent sugar replacement. Replace the ground sausage with fresh chorizo or a turkey sausage mixture.